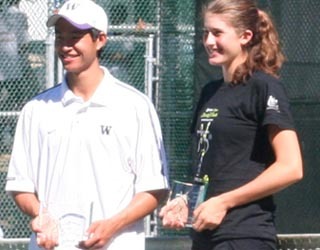 Meet Daniel Chu (Van) and Rebecca Marino (Van), the winners of 2006 Open Singles titles. Daniel, above, beat Nick Coutts, 6-3, 6-3 in the final and Rebecca beat Stefi Gjine, 6-3, 6-3, for her second Stanley Park title. Photo 1: Nick Coutts team up with Patrick Flint to beat Jeremy Salvo and Kris Santoso to win Men's Open Doubles title. Nick plays for the University of Utah. Photo 3: Daniel Chu and the family. Daniel plays for the University of Washington. His younger brother, David, lost in the quarters to the defending champ Graeme Kassautzki. Graeme, later was eliminated in the semis by Nick Coutts. Photo 4: Ally Muller, left, and her double's partner, Robin Guier, sought shade under trees. It was 32-34C at the courtside on the weekend. Photo 6: Justine Walsh, with mom, Glenice, dad, Peter and brother, Matthew; lost in quarters to Rebecca Marino, the eventual winner of Women Singles title. Justine plays for University of South Carolina. The longest match (over three hours) belongs to Sinziana Chis, left in the photo, and Monica Neveklovska, both from West Vancouver, with Monica beating Sinziana in a close match 4-6, 6-2, 7-6. Monica lost in the semis to Stefi Gjine. Team of Monica and her double partner Amanad Mankovits lost in the final of Open Doubles to Amanda Augustus and Renata Kolbovic, 6-3, 6-2, but she and her mixed double partner David Kuczer won the final of Mixed Open Doubles, beating Rebecca and West Nott 6-4, 6-3.